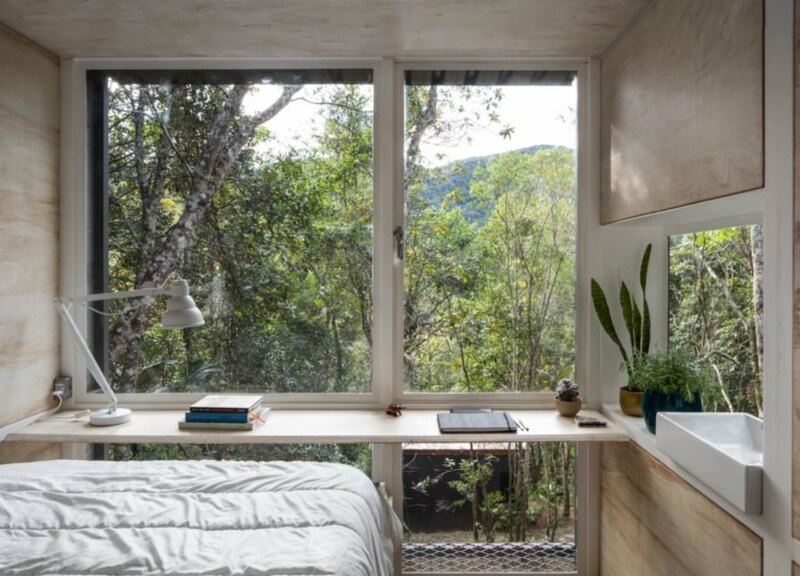 Located in the most southeastern part of São Paulo, the tiny cabin is located in an idyllic valley, surrounded by a dense forest filled with soaring trees and greenery. 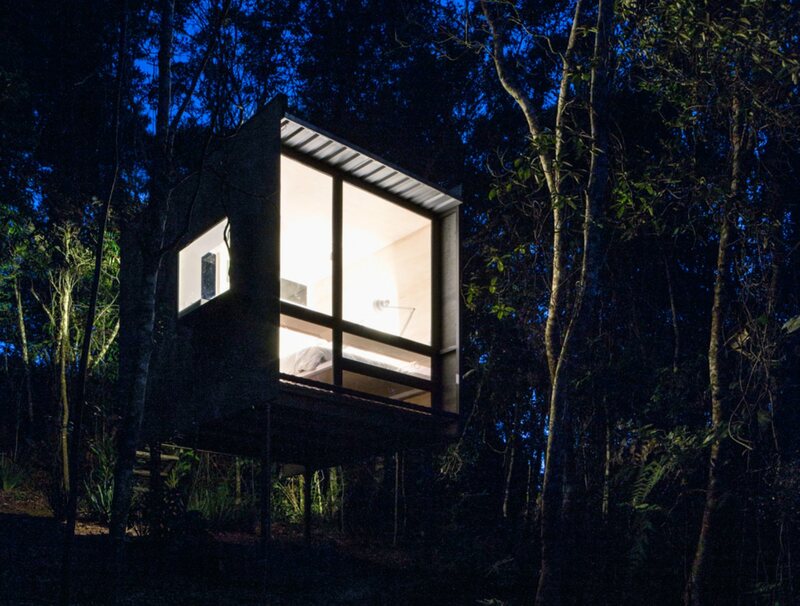 The cabin is lifted off the ground to reduce impact on the natural landscape. Being lifted off the ground also gave the architect the opportunity to orientate the cabin’s large glazed facade to face the best views of the mountains across of the valley. Chalet L is made out of steel frames and clad in “a cementitious slab on the sides” which were used to insulate the tiny structure to help the interior space maintain a comfortable temperature year round. The roof was built out of metallic layered tiles, which were used to add extra insulation to help keep the interior space cozy. There are no roads or walkways that provide access to the cabin. 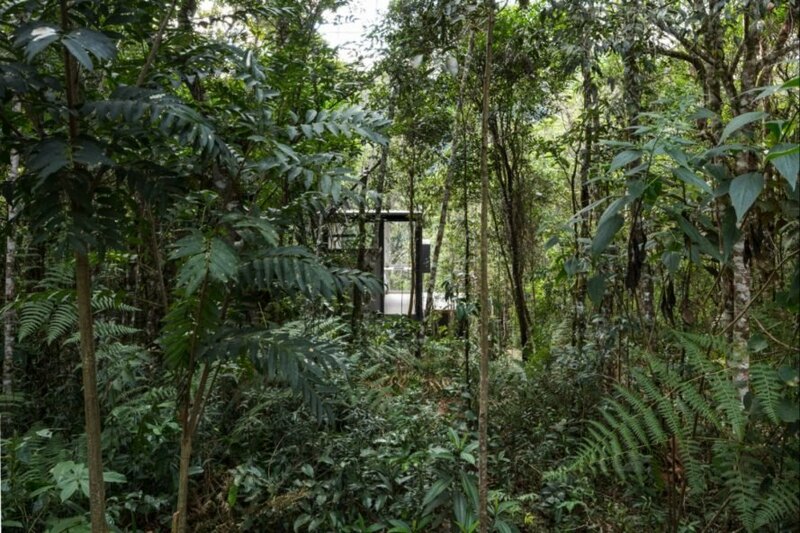 Instead, a simple walking trail leads to the structure, which is camouflaged into the tree canopy. Inside the cabin is minimalist space with just one room with light plywood cladding used on the walls. At the heart of the design is the large floor-to-ceiling glazed wall that provides unobstructed views of the forest and mountain range in the distance. The furnishings are sparse, just a bed, desk, sink and built-in nightstand provide the basic necessities needed to enjoy the small refuge. Chalet L was designed to be a minimalist retreat in the forest. The tiny cabin is built on tall stilts to reduce impact on the land. 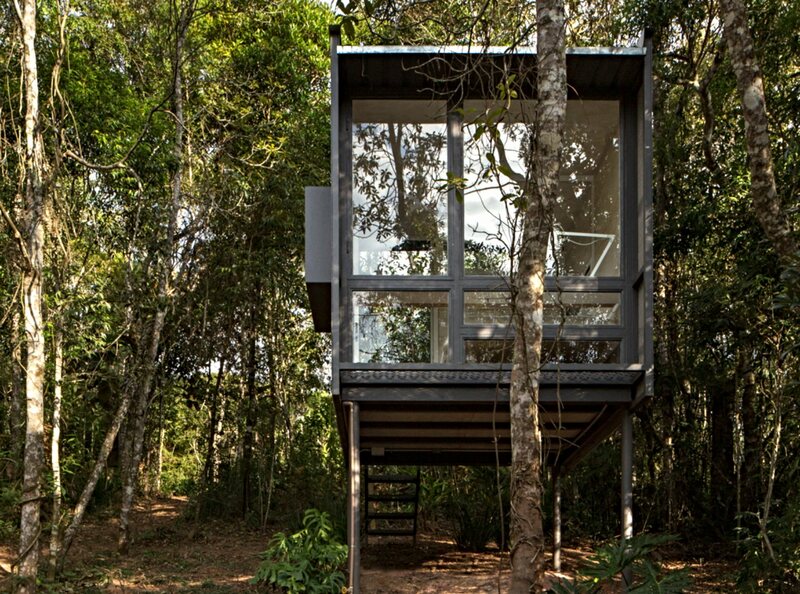 Chalet L is located in a lush Brazilian forests. 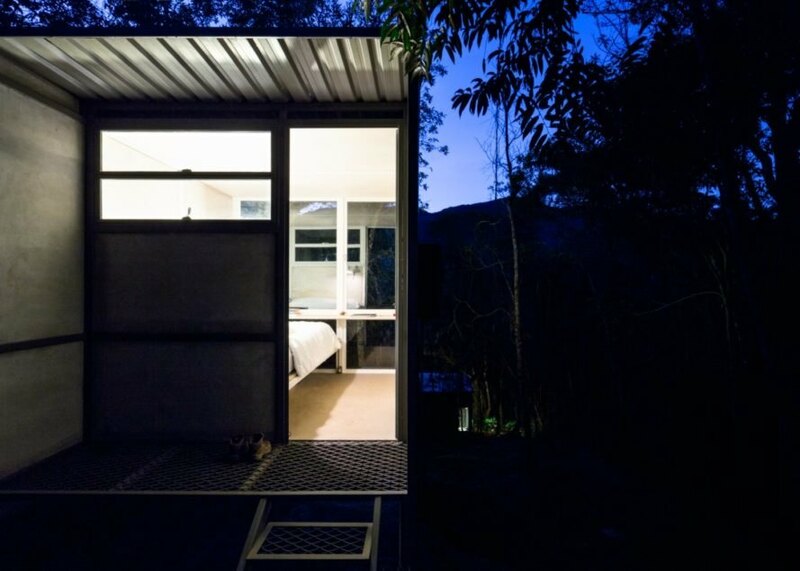 The tiny cabin has just one room. A glazed facade provides stunning views. 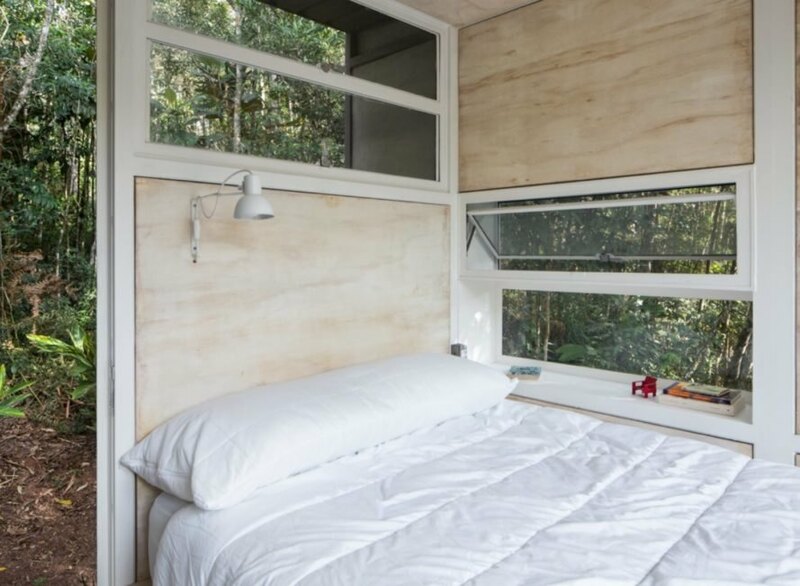 The glazed wall floods the interior with natural light. 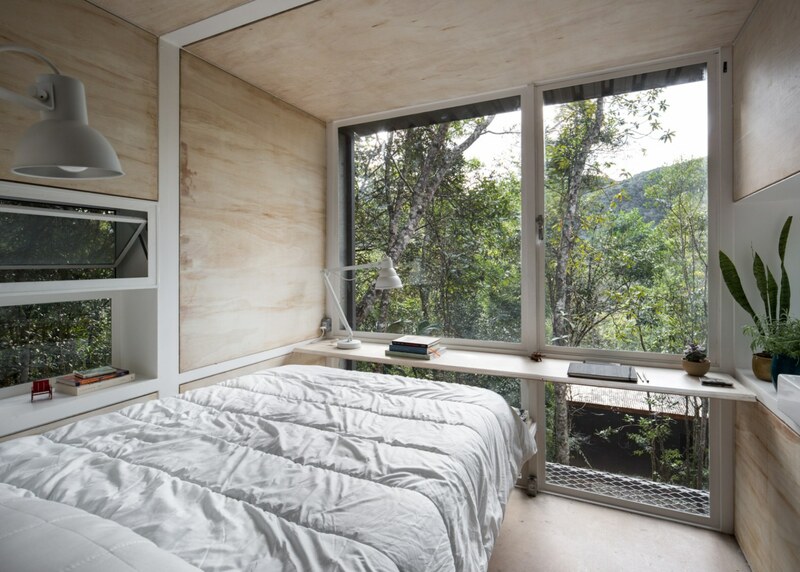 The cabin has one double bed and a simple nightstand. Layout diagram of Chalet L's interior. Layout diagram of Chalet L interior.